Originally published under the title "The War of Civilizations Continues in Europe." 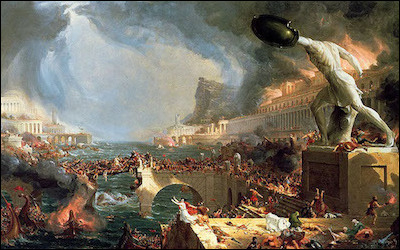 Thomas Cole, Destruction. Oil on canvas, 1836. In the latest terrorist attacks, a bomb blew up inside a St. Petersburg subway station, killing 14 Russians, barely a fortnight after a jihadi killed four people in London, England. Yet there are still many in Canada who wrongly believe the enemy we face is Islamophobia and not Islamofascism. By contrast, in Europe, it is increasingly difficult to conceal the truth under the guise of political correctness. On April 23, the French will go to the polls in the opening round of their presidential election. Like the Dutch before them, one of the central issues dividing the electorate is the role of radical Islam and radical Muslims in the future of Europe. In Holland, the major voice against the rise of radical Islam was Geert Wilders, whose party lost to the centre-right government of Prime Minister Mark Rutte. 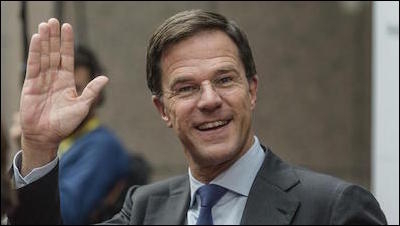 Dutch Prime Minister Mark Rutt was obliged to become a vocal opponent of Islamization to win reelection. But that happened only after Rutte outflanked Wilders in becoming a vocal opponent of Islamization, and demonstrated it by barring Turkey's foreign affairs minister from attending or speaking at an event just days before the election. In France, the baton to lead the "clash of civilizations" foretold by Samuel Huntington in 2002 has been taken up by Marine Le Pen, who heads the National Front and is working to galvanize French voters with her anti-Islamist rhetoric. While Huntington has long been credited for predicting the clash of civilizations now unfolding in Europe, it was a Dutch writer of Pakistani origin, using the pseudonym "Mohamed Rasoel," who on March 6, 1989 wrote in the newspaper NRC Handelsblad about his fears of a disaster unfolding inside Dutch society. Mohamed Rasoel's prescient warning about the impact of open-door immigration on Holland. 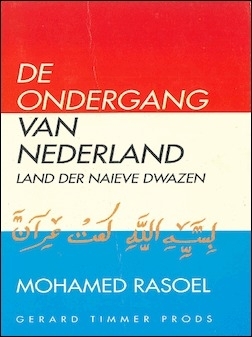 Later expanded as his book De ondergang van Nederland -- Land der naïeve dwazen (The Decline of the Netherlands -- Land of the Naive Fools), Rasoel warned the open-door immigration policy in Holland of allowing radical, anti-western Islamists to settle in segregated ghettoes would one day trigger serious conflict. Its publication created a firestorm storm after the writer appeared on several Dutch TV talk shows, as jihadis called for Rasoel's head and he had to go into hiding under police protection. His book was reprinted several times and soon sold out, but not before it was essentially banned and the author fined $4,000 for "incitement to hatred on grounds of race or religion." I recently met with Rasoel, who also goes by the name "Mansour," in Amsterdam in March to discuss the Dutch elections. Twenty-seven years later, much of what Mansour predicted has come true. In Europe, it is increasingly difficult to conceal the truth about Islamofascism. His book continues to make waves. In December 2007, Wilders stood in parliament and asked that The Decline of the Netherlands be distributed in all Dutch schools. Last month, as the Dutch voted in their election, I sat with Mansour inside the Schiphol Airport to discuss our native Pakistan, India, the country we both love, and the West that we had both chosen as our homes. "The problems in Holland started in the 60s and 70s when the delusional flower power government called in workers from Turkey and Morocco, not knowing they had actually let in the Trojan horse," he told me. "It's now up to the French" he responded. "Will Le Pen be the new Marianne of a new French Revolution against the forces of darkness?" he asked with a shrug as we parted company.